Qatar Airways is the 12th and newest operator of the Airbus A380 after taking delivery of its first of 10 double-decker jumbos on order during a ceremony in Hamburg on Wednesday. Acceptance of the aircraft, A7-APA, had been delayed a number of months as the airline finalised the aircraft interiors, but the Doha-headquartered carrier expected to have four of the type, which are configured with 517 seats across first, business and economy classes, delivered by the end of 2014. 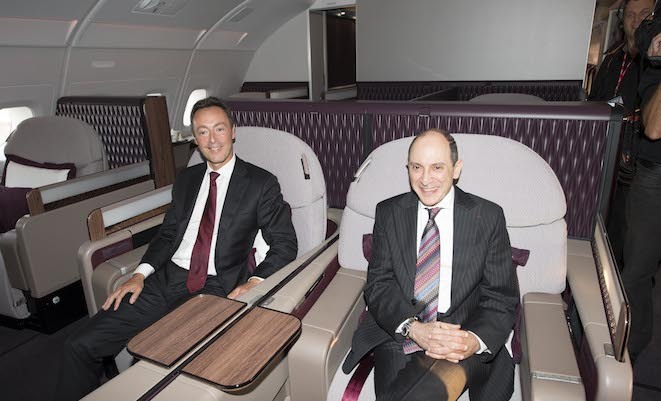 “The A380 that we are introducing is not just any A380, we have completely designed every element, giving it a signature touch that has never been seen before on board,” Qatar Group chief executive Akbar Al Baker said. Qatar’s first A380 revenue flight will be from Doha to London on October 10.